Peter Sedgwick was born in 1934, joined the Communist Party of Great Britain (CPGB) in 1954, left it in the aftermath of the Hungarian Revolution two years later, then joined the Socialist Review Group. This small organization, headed by Tony Cliff, later became the International Socialists (IS). Sedgwick became a frequent contributor to their journal, International Socialism. When the organisation took a turn towards Leninist party-building and renamed itself Socialist Workers Party in 1977, Sedgwick left the group. He fiercely opposed this step, calling it a ‘propaganda-act’, a ‘silly fling’ and a fraud. Sedgwick worked as a psychologist and school teacher before lecturing on politics at the universities of York and Leeds for the last 15 years of his life. He was the eminent translator of the works of communist dissident Victor Serge. 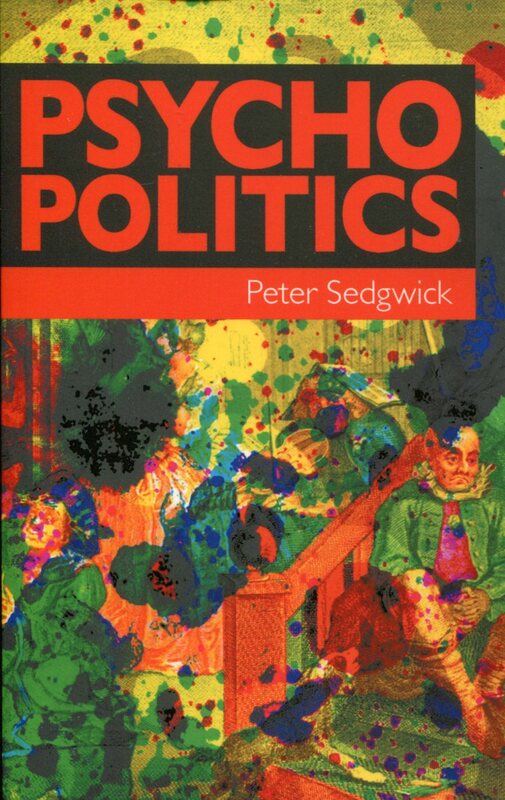 Besides dozens of articles in the press of the IS, Sedgwick’s main work is Psycho Politics – Laing, Foucault, Goffman, Szasz and the Future of Mass Psychiatry. This book was originally published by Pluto Press in 1982 and was an assault on the ideology of the anti-psychiatry movement of the 60s and 70s and its relative hegemony concerning positions towards mental health issues in the radical left at the time. He sets out to show how these ideas, originally devised in the interest of the ‘mentally ill’, provided ammunition to those on the right with the agenda of dismantling the welfare state, giving them arguments to withhold adequate funding from the mental health institutions and ultimately shifting the responsibility of taking care of the mentally ill back to ‘the community’ or the family. At the root of this is the dispute whether mental illness is to be considered an illness at all. If it is merely labelling and punishing unconventional behaviour, then surely a liberatory praxis would include an attack against the ‘total institution’ and a defence of the deviant or dissident who has been ‘judged’ by the powers that be, personified by the psychiatrist. Indeed much of anti-psychiatry went in that direction, even to the point of seeing the boundary-loss and depersonalisation associated with ‘schizophrenia’ as positive virtues. In view of asylums that have as a sole function the locking-away of the ‘mentally ill’ and the use of psycho-pharmaceuticals that seem to merely silence the ‘crazy’ person into a docile life-long consumer, it is tempting to see the psychiatric system as nothing more than the implementation of social control. The horror-scenarios of life-long institutionalisation or debilitating drug-dependency are certainly not completely invented or even far fetched. But psychiatry should not be considered the same as applied sociology, whether in one direction or in the other; neither in the sense of silencing the ill nor in the sense of denying the reality of mental illness. Dealing with actual bouts of mental illness is often a lose-lose situation for those affected. Denial then is not an option. Support structures are essential in such situations. Family and friends are often overwhelmed and mutual hostility, or helplessness and anguish, can lead to a psychological gridlock where everyone suffers. The dismantling of facilities and inadequate funding for their replacements on the one hand and the power of the pharmaceutical companies on the other are just two sides of the same (neo-liberal) coin. Sedgwick is making a series of carefully considered counter-arguments against a number of writers associated more or less with the movement of anti-psychiatry, beginning with the sociologist Erving Goffman, with a review of his works on the asylum and the stigma. The author’s main target however is Ronald D. Laing (the ‘arch-seer and prophet-in-chief’) to whom he dedicates two detailed chapters titled The Radical Trip and The Return to Psychiatry. He describes Laing’s career from army psychiatrist to New Left luminary in a time when it was possible to be a political radical and a cultural celebrity at the same time. Soon enough it became much less fashionable to profess Marxist affinities and Laing was one of those in the 70s who repudiated socialism, which leads Sedgwick to note: ‘In retrospect, the radicalism was less an implication than an obscure insinuation’. At the same time, Laing apparently distanced himself from the acid-fuelled psychedelic revolution in favour of a more harmless ‘eastern mysticism’. While it is not completely clear why he directs so much flak towards Laing, there is not so much doubt in the case of Thomas S. Szasz. Szasz is indeed a right-wing libertarian who stands for a systematic denial of mental illness as illness and Sedgwick calls him the ‘doyen of mental-health revisionism and the herald of the newer orthodoxies of right-wing thought on welfare in the post-collectivist epoch of Ronald Reagan and Margaret Thatcher’. Author of the book The Myth of Mental Illness, Szasz also co-founded the Citizens Commission on Human Rights along with the Church of Scientology, although he himself was never a Scientologist. He sees the mental patient as a victim of a new Inquisition, the scapegoat principle incarnate in our times. Another chapter is dedicated to Michel Foucault and his Anti-History of Psychiatry, where Sedgwick demolishes some of the results of Foucault’s research, such as the claim that the asylums replaced the by then empty leper houses and that confinement started with the Age of Reason. Foucault’s agenda, it seems, is more an attack on ‘totalitarian reason’ than a historical work. This anti-rationalism, it could be argued, may have led to his flirt with Islamism in the form of support for the 1979 Islamic Revolution in Iran. This is however not what Sedgwick is concerned with. His issue is a rejection of ‘Foucault’s anti-psychiatric romanticism’ and the plea that the ‘mythology of madness’ propagated by both ‘many psychiatrists as well as by anti-psychiatrists’ should be rejected. ‘One central task of a radical political programme for the mentally ill is to enable them to appraise and select the judgements of the medically qualified (for example, over chemical therapies or spells of hospitalisation) rather than to confirm their own passivity by obedience to the doctor’s writ’ (p.162). In other words, to return agency to the ill, rather than putting them into the role of victims. While Sedgwick singles out Laing, Szasz and Foucault, he is not so much concerned with other aspects of the wider anti-psychiatry movement, such as the Italian ‘democratic psychiatry’ movement or David Cooper, all mentioned in the book, but not really treated. I wonder if this is because the Italians and Cooper have (as Sedgwick acknowledges) actual left-wing credentials. Cooper declares right at the beginning of one of his more far-out books, The Language of Madness, ‘The prevalent romanticization of madness has no future. The politicization of madness is indispensable if we would create a future’. Prominent ‘democratic psychiatrists’ Franco and Franca Basaglia even explicitly denounce the fact that a ‘modern’ approach – recognising the psychiatric institution as a source of illness rather than a means to its cure – can be used by ‘enlightened’ politicians to neglect the very real problem of having to take care of the many inmates of these same institutions. Their approach seems in many ways similar to Sedgwick’s once we understand that Psycho Politics is not a pro-psychiatry tract. Sedgwick is very much informed by the swing into counter-revolution in society since the late 70s, and his concern here is to expose how movements that were perceived as progressive or revolutionary could be adopted by the other side, or even turn out to be part of that other side from the beginning. But Sedgwick’s scathing critique of the anti-psychiatry movement seems to throw out the baby with the bath water. As the editors remark in their foreword: ‘In an alternative universe, perhaps Laing and Sedgwick could have lived to develop a dialectical synthesis of their ideas; to formulate an oppositional platform that truly puts the interests and voices of “the mad” at the heart of demands for their better care’. Sedgwick unfortunately died – a presumed suicide – soon after the first publication of his book. It appears that this also put a stop to what could have been a fruitful discussion of different oppositional approaches to issues of mental health. Current activists in the field should read this book, now republished by Unkant, alongside publications from the anti-psychiatry movement(s) and use the best elements to devise working alternatives to the dominant mental health ideologies.